1999: Best of Show, Crossed Connections, TLD Gallery, Westmont, IL. Michele rediscovered the pleasure of working with fabric after leaving a career as an oil exploration geophysicist. 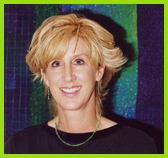 Since the mid-1990s her work has focused on mixed media fiber construction and art quilts, incorporating surface design, quilting, and embroidery techniques which she has adapted in her personalized approach to images in textile assemblage. Vibrant color, texture, and graphic appeal are all important energies in her images. Michele's artworks are continually featured in national exhibits, receiving numerous awards including several Best of Show and awards for color and craftsmanship. Her work has appeared in numerous publications including Surface Design, American Craft, and Fiberarts Design Books . 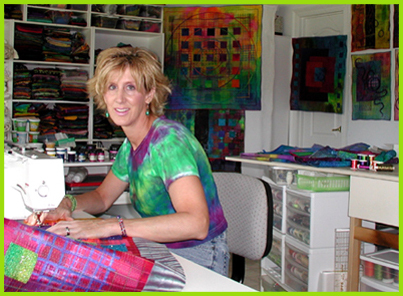 Michele is a professional artist member of Studio Art Quilt Associates and an active member of the Surface Design Association. Her artworks are in public and private collections throughout North America, including the State of Louisiana's Claiborne Collection. I have always loved both color and fabric. As an artist, working in the fiber/art quilt medium allows me to explore the wonders of color and texture using a variety of fabrics, paints, dyes, and lots of thread. I am inspired by all that is colorful and wonderful in our world: rocks, mountains, deserts, oceans, sunsets, outer space, architectural details, my travels, my family, and all the experiences of my life. Currently I am exploring ways to challenge the boundaries of what is considered fine craft and fine art and to bridge that gap by incorporating more familiar and accepted fine arts materials and techniques into my fiber pieces. The notion of looking out or looking in and seeing a fragment of our world is the current theme in my art, which I explore in several series of nature-based abstractions. My lifelong love of geology and nature has been the inspiration for this work and continues to supply me with an unlimited palette of color, textures, and ideas. Characteristics of my work include strong texture, contrast, and graphic appeal, and vibrant color. The relationship between the colors and shapes is an important part of my imagery, juxtaposing large blocks of color and areas of intricate stitched detail. I portray very definite divisions of what is below or above, upon or within, with clear lines that define the boundaries between them. These can be interpreted as landscapes, cross-sections, and maps of our world, or they can viewed as purely abstract forms, leaving the viewer to their own associations. The choice of color is an important energy in my images since how we view the world often depends on how we color our own personal worlds. Michele Hardy is a full-time studio artist possessing a playful sense of color and form. With her vivid imagination, and inspiration from the real world, she creates intriguing fiber art. Her colorful abstract imagery is heightened by her elaborate threadwork and use of texture. Michele uses a variety of dyed, painted and printed fabrics and an assortment of decorative threads in her work. Originally from New England, she has lived in California, Texas, Louisiana, and Colorado. Michele now resides in Silverthorne, Colorado. My technique is a combination of fiber collage, quilting, and embroidery. Spontaneity is an important aspect of my creative process. I use a variety of dyed, painted, and commercial fabrics, many of which are transformed by extensive printing and/or stitching prior to construction. I typically construct a background, arrange and layer images, quilt, then add additional machine embroidery to complete the piece.